At the heart of this dish is the simple yet satisfying combination of slow roast duck legs and duck fat new potatoes. But what makes this recipe so great is that it requires next to no preparation time and all the peeling, par-boiling, trimming and other malarkey that can sometimes go with a dish like this is avoided altogether. All the flavour, none of the fuss - my kind of recipe. 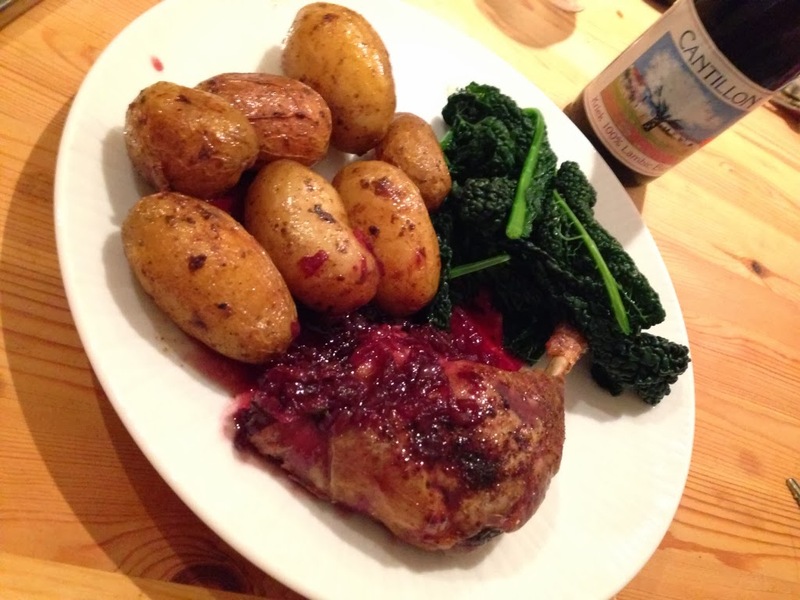 If you really want to keep things super-easy you can eat the roasted new potatoes and duck legs as they are with a crisp green salad – or alternatively whip up a quick redcurrent and wine sauce as I have done here and serve with some buttered cavalo nero. Delicious. Start by throwing your new potatoes into a high sided baking tray or lasagne dish with just a tiny drizzle of olive oil (the duck will provide more than enough fat to keep them from sticking) and plenty of salt and fresh black pepper. 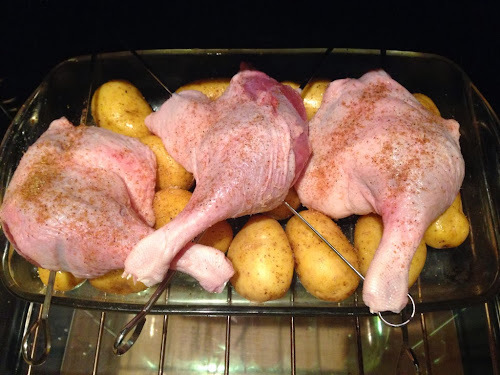 Next season your duck legs with a little five spice powder, salt and pepper, then place on a wire rack above the potatoes. Alternatively use some metal bbq skewers as I did. Don’t worry if the duck touches the potatoes a little. Place the potatoes and duck into a preheated oven at 220*C and blast for 15 minutes, before reducing the heat to 180 and cooking for a further one to one and a half hours – or until the duck is crisp and the potatoes lightly golden. Once you’re happy with the duck remove to a plate to rest and drain most of the fat out of the baking dish and into a frying pan. Then place the potatoes back in oven at a low heat (100*C is fine) to keep warm while you make your sauce. Fry the chopped onion in the duck fat until soft then add the garlic and thyme, cook for another minute or so, then deglaze the pan with the wine. 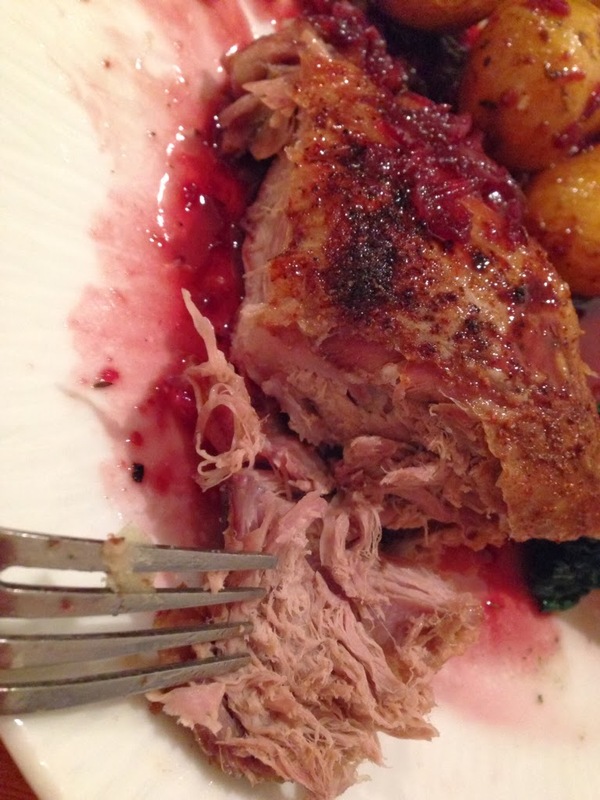 Once reduced slightly add the redcurrant jelly, thyme and balsamic and cook until dissolved, bubbling and thickened. Season to taste and finish with a large knob of butter to give a nice shine to the finished sauce. I usually put the cavalo nero on to steam while I make the sauce (roughly 5 minutes), but if it’s your first time making it then feel free to make the sauce first and keep warm before you put the cabbage on to cook. Simply arrange on a plate and spoon the sticky sweet sauce over the side of your duck, being careful not to fully smother the skin as this will undo all the hardwork you’ve dojne getting it delicious and crispy! I paired this with a ferociously tart Cantillion Kriek which was fantastic at cutting through the richness and sweetness in the dish, but many might find it a bit too overpowering. If you’re looking for something a bit more approachable to match with this dish then a bottle of Liefmans Kriek (available in many supermarkets) would work very well, or alternatively a Flemish sour brown ale such as Rodenbach or Duchesse de Bourgogne – which would certainly bring out the sweet and sour character of the balsamic, redcurrant and red wine sauce. IE nonetheless is the market chief and a good section of other folks will omit your magnificent writing due to this problem.